Predictably, the dialogue between the supporters of the Deccan Trap flood basalts and the Chicxulub impact as triggers that were responsible for the mass extinction at the end of the Mesozoic Era (the K-Pg event) continues. A recent issue of Science contains two new approaches focussing on the timing of flood basalt eruptions in western India relative to the age of the Chicxulub impact. One is based on dating the lavas using zircon U-Pb geochronology (Schoene, B. et al. 2019. U-Pb constraints on pulsed eruption of the Deccan Traps across the end-Cretaceous mass extinction. Science, v. 363, p. 862-866; DOI: 10.1126/science.aau2422), the other using 40Ar/39Ar dating of plagioclase feldspars (Sprain, C.G. et al. 2019. 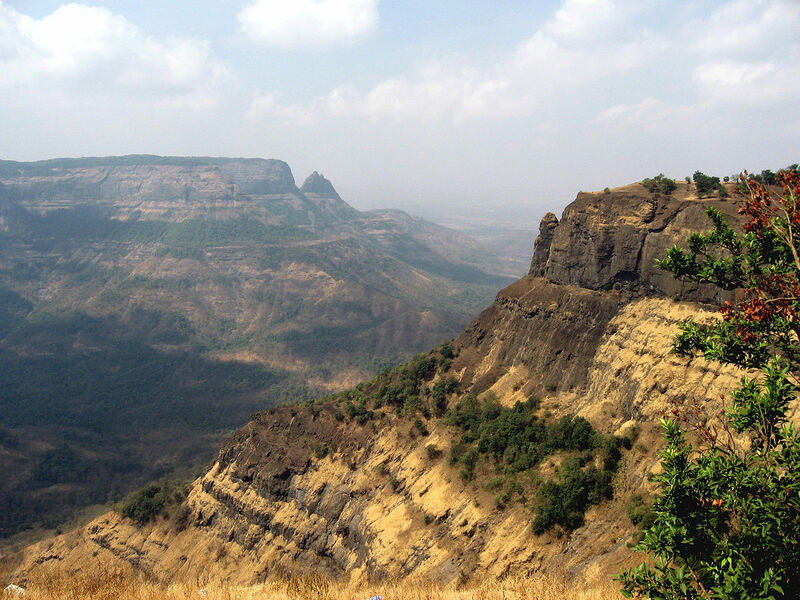 The eruptive tempo of Deccan volcanism in relation to the Cretaceous-Paleogene boundary. Science, v. 363, p. 866-870; DOI: 10.1126/science.aav1446). Both studies were initiated for the same reason: previous dating of the sequence of flows in the Deccan Traps was limited by inadequate sampling of the flow sequence and/or high analytical uncertainties. All that could be said with confidence was that the outpouring of more than a million cubic kilometres of plume-related basaltic magma lasted around a million years (65.5 to 66.5 Ma) that encompassed the sudden extinction event and the possibly implicated Chicxulub impact. The age of the impact, as recorded by its iridium-rich ejecta found in sediments of the Denver Basin in Colorado, has been estimated from zircon U-Pb data at 66.016 ± 0.050 Ma; i.e. with a precision of around 50 thousand years. Because basalts rarely contain sufficient zircons to estimate a U-Pb age of their eruption, Blair Schoene and colleagues collected them from palaeosols or boles that commonly occur between flows and sometimes incorporate volcanic ash. Their data cover 23 boles and a single zircon-bearing basalt. Sprain et al. obtained 40Ar/39Ar ages from 19 flows, which they used to supplement 5 ages obtained by their team in previous studies that used the same analytical methods and 4 palaeosol ages from an earlier paper by Schoene’s group. The zircon U-Pb data from palaeosols, combined with estimates of magma volumes that contributed to the lava sequence between each dated stratigraphic level, provide a record of the varying rates at which lavas accumulated. The results suggest four distinct periods of high-volume eruption separated by long. periods of relative quiescence. The second such pulse precedes the K-Pg event by up to 100 ka, the extinction and impact occurring in a period of quiescence. A few tens of thousand years after the event Deccan magmatism rose to its maximum intensity. Schoene’s group consider that this supports the notion that both magmatism and bolide impact drove environmental deterioration that culminated in mass extinction. The Ar-Ar data derived from the basalt flows themselves, seem to tell a significantly different story. A plot of basalt accumulation, similarly derived from dating and stratigraphy, shows little if any sign of major magmatic pulses and periods of quiescence. Instead, Courtney Sprain’s team distinguish an average eruption rate of around 0.4 km3 per year before the K-Pg event and 0.6 km3 per year following it. Yet they observe from climate proxy data that there seems to have been only minor climatic change (about 2 to 3 °C warming) during the period around and after the K-Pg event when some 75% of the lavas flooded out. Yet during the pre-extinction period of slower effusion global temperature rose by 4°C then fell back to pre-eruption levels immediately before the K-Pg event. This odd mismatch between magma production and climate, based on their data, prompts Sprain et al. to speculate on possible shifts in the emission of climate-changing gases during the period Deccan volcanism: warming by carbon dioxide – either from the magma or older carbon-rich sediments heated by it; cooling induced by stratospheric sulfate aerosols formed by volcanogenic SO2 emissions. That would imply a complex scenario of changes in the composition of gas emissions of either type. They suggest that one conceivable trigger for the post-extinction climate shift may have been exhaustion of the magma source’s sulfur-rich volatile content before the Chicxulub impact added enough energy to the Earth system to generate the massive extrusions that followed it. But their view peters out in a demand for ‘better understanding of [the Deccan Traps’] volatile release’. 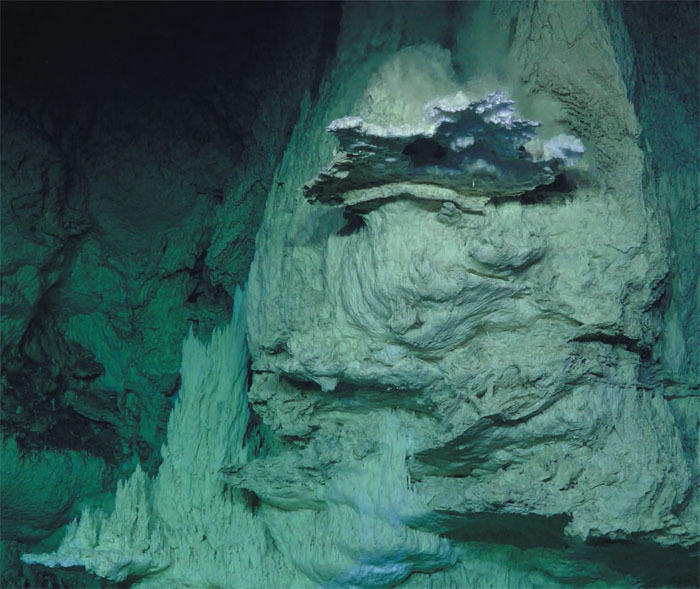 A range of indirect evidence has been used to suggest that life originated deep in the oceans around hydrothermal vents, such as signs of early organic matter in association with Archaean pillow lavas. One particularly persuasive observation is that a number of proteins and other cell chemicals are constructed around metal sulfide groups. Such sulfides are common around hydrothermal ‘smokers’ associated with oceanic rift systems. Moreover, Fischer-Tropsch reactions between carbon monoxide and hydrogen produce quite complex hydrocarbon molecules under laboratory conditions. Such hydrogenation of a carbon-bearing gas requires a catalyst, a commonly used one being chromium oxide (see Abiotic formation of hydrocarbons by oceanic hydrothermal circulation May 2004). It also turns out that fluids emitted by sea-floor hydrothermal systems are sometimes rich in free hydrogen, formed by the breakdown of olivine in ultramafic rocks to form hydroxylated minerals such as serpentine and talc. The fact that chromium is abundant in ultramafic rocks, in the form of its oxide chromite, elevates the possibility that Fischer-Tropsch reactions may have been a crucial part of the life-forming process on the early Earth. What is needed is evidence that such reactions do occur in natural settings. One site on the mid-Atlantic ridge spreading centre, the Lost City vent field, operates because of serpentinisation of peridotites exposed on the ocean floor, to form carbonate-rich plumes and rocky towers; ‘white smokers’. So that is an obvious place to test the abiotic theory for the origin of life. Past analyses of the vents have yielded a whole range of organic molecules, including alkanes, formates, acetates and pyruvates, that are possible precursors for such a natural process. Revisiting Lost City with advanced analytical techniques has taken the quest a major step forward (Ménez, B. et al. 2018. Abiotic synthesis of amino acids in the recesses of the oceanic lithosphere. Nature, advance online publication; DOI: 10.1038/s41586-018-0684-z). The researchers from France and Kazakhstan focused on rock drilled from 170 m below the vent system, probably beyond the influence of surface contamination from living organisms. Using several methods they detected the nitrogen-containing amino acid tryptophan, and that alone. Had they detected other amino acids their exciting result would have been severely tempered by the possibility of surface organic contamination. The formation of tryptophan implies that its abiotic formation had to involve the reduction of elemental nitrogen (N2) to ammonia (NH3). Bénédicte Ménez and colleagues suggest that the iron-rich clay saponite, which is a common product of serpentine alteration at low temperatures, may have catalysed such reduction and amino-acid synthesis through Friedel–Crafts reactions. Fascinating as this discovery may be, it is just a step towards confirming life’s abiogenesis. It also permits speculation that similar evidence may be found elsewhere in the Solar System on rocky bodies, such as the moons Enceladus and Europa that orbit Saturn and Jupiter respectively. That is, if the rock base of hydrothermal systems thought to occur there can be reached. Related article: Baross, J.A. 2018. The rocky road to biomolecules. Nature, v. 564, p. 42-43; DOI: 10.1038/d41586-018-07262-8. John Murray of The Open University, UK has been studying Europe’s largest active volcano Mount Etna on Sicily for most of his career. With a group of colleagues he installed high-precision GPS receivers at over 100 stations on the flanks of the mountain. This was to monitor any shifts in elevation and geographic position, which might be related to magmatic events within the volcano, such as inflation and contraction of the magma chamber. Measurements of position gathered annually since 2001 reveal a somewhat alarming picture (Murray, J.B. et al. 2018. Gravitational sliding of the Mt. Etna massif along a sloping basement. Bulletin of Volcanology, v. 80 online, open access; doi /10.1007/s00445-018-1209-1). The edifice is moving relentlessly ESE at 14 mm yr-1, on average, towards the Mediterranean Sea. 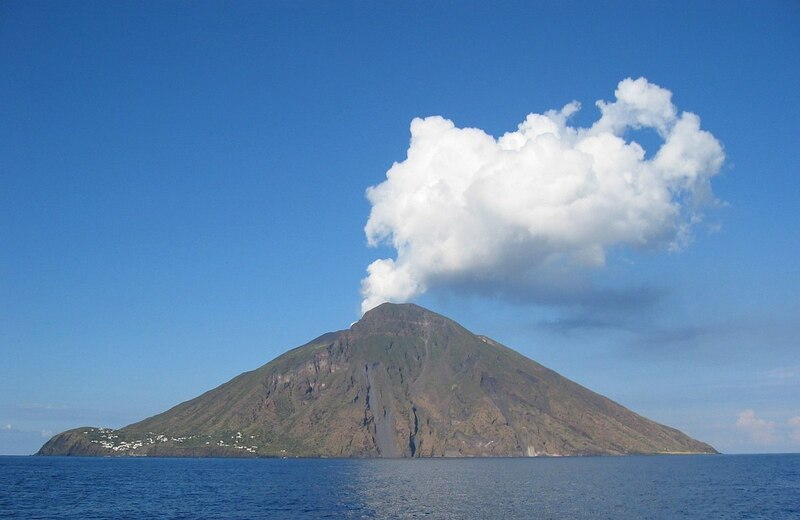 Research by one of Murray’s co-authors, Benjamin van Wyk de Vries of the Université Clermont Auvergne, established that many volcanoes have associated signs of deformation due to their huge masses. Often, this is a matter of radial spreading that produces thrust-like faults at their base and in the basement on which they grew. In the case of Etna all the annual displacements on its flanks are skewed to the ESE. The researchers are able to show that this is not a case of flank instability that ultimately may result in lateral collapse but the entire volcano is slowly slipping sideways. An experimental mock up of the volcano– a cone and flanking layers of lava and pyroclastic rocks made of sand on a substrate of putty to represent underlying sedimentary strata – began to slide once it was tilted at a shallow angle. This suggests that the base of the volcano and igneous debris that it has emitted dips gently to the ESE. The underlying materials are poorly consolidated Quaternary sediments, which are likely to be rheologically weak. Geophysics shows that the NW side of the volcano rests on an almost horizontal plateau, the cone itself being above a spoon-like depression, probably produced by the cone’s mass, and the base dips seawards in the SE sector. It is through this basement that magma makes its way to Etna’s summit vent system, probably along fractures. The authors warn that such sliding volcanoes are prone to devastating sector collapse on the downslope side, although there are no signs that might be imminent. Yet it will almost certainly have an effect on eruptive activity as the magma conduits are continually changing. Future research needs to focus on periods when there is horizontal contraction on the volcano, as happens during lengthy periods of dormancy – the period for which there are data has been one of expansion. Most volcanic activity stems from the rise of hot, deep rock, usually within the mantle. Pressure suppresses partial melting, so as hot rock rises the greater the chance that it will begin to melt without any rise in its temperature. That is the reason why mantle plumes are associated with many volcanic centres within plates. Extension at oceanic ridges allows upper mantle to rise in linear belts below rift systems giving rise to shallow partial melting, mid-ocean ridge basalts and sea-floor spreading. These aren’t the only processes that can reduce pressure to induce such decompression melting; any means of uplift will do, provided the rate of uplift exceeds the rate of cooling at depth. As well as tectonic uplift and erosion, melting of thick ice sheets and major falls in sea level may result in unloading of the lithosphere. During Messinian Stage of the late Miocene up to 3 km of evaporitic salt was deposited in the deepest parts of the Mediterranean Basin. One mechanism might have been faster evaporation of seawater than its resupply from the Atlantic through the Straits of Gibraltar, similar to the way in which salts is deposited below the Dead Sea. But the salt layer beneath the modern Mediterranean Sea bed has interleaved riverine sediments containing fossils of land plants. The Straits had closed and the Mediterranean Sea evaporated away. From about 6 to 5.3 Ma ago sea level fell by 3 to 5 km, only returning to normal when the Straits reopened to launch the huge Zanclean flood, with which the Pliocene of southern Europe and North Africa commenced. A team from the Universities of Geneva, Orleans and Paris and the Instituto de Ciencias de la Tierra Jaume Almera in Barcelona has tested the hypothesis that the Messinian Crisis affected volcanic activity in the area (Sternai, P. et al. 2017. Magmatic pulse driven by sea-level changes associated with the Messinian salinity crisis. Nature Geoscience, v. 10 online; doi:10.1038/ngeo3032). From the record of salt precipitation, Pietro Sternai and colleagues, reckon that the main phase of unloading of the Mediterranean Basin began at around 5.6 Ma. Allowing for loading by the thick evaporites they calculated that the effect of the loss of water mass was equivalent to an unloading of 15 MPa in the deeper Eastern Mediterranean and 10 MPa in the west. Using standard pressure-temperature melting curves for the upper mantle, they then estimated that any magma chambers affected by the decrease in pressure could yield up to 17% more melt. Radiometrically dated lavas and igneous dykes within the Mediterranean region became more frequent and the number of events more than doubled during the time of main salt deposition. 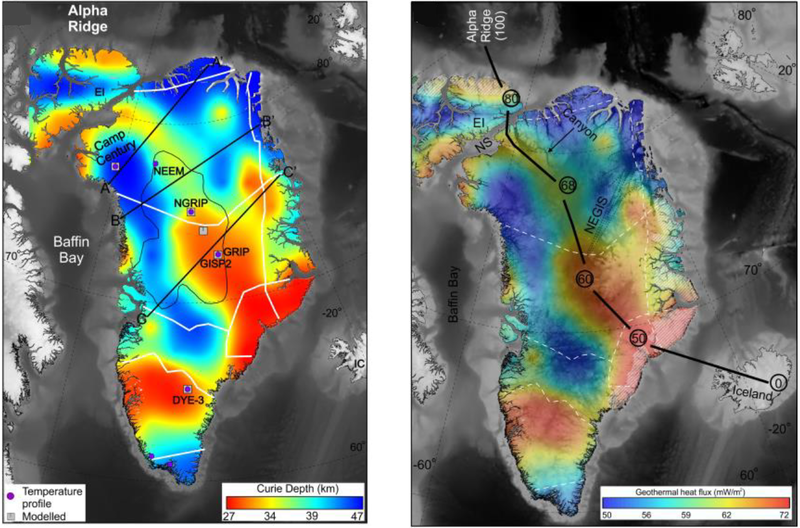 In May 2017 a study of subglacial volcanoes in West Antarctica based on radar mapping of the solid surface identified 138, 91 of them previously unknown (van Wyk de Vries et al. 2017. A new volcanic province: an inventory of subglacial volcanoes in West Antarctica. Geological Society, London, Special Publication 461) They lie within a buried rift system and are covered by thick ice. Only one volcano in Antarctica is known to be active, Erebus, which is part of the cluster. Most of the news items stemming from the publication mentioned the possibility that the buried volcanic tract could be adding to the instability of the West Antarctic Ice Sheet through heating up its base. The WAIS is the ice sheet most feared to collapse seawards leading to a rise of about 3 m in global sea level. If the 2 km thick WAIS did slide off its underlying crust it might possibly trigger reactivation of the volcanic cluster. The dominant feature of Phanerozoic stratigraphy is surely the way that many of the formally named major time boundaries in the Stratigraphic Column coincide with sudden shifts in the abundance and diversity of fossil organisms. That is hardly surprising since all the globally recognised boundaries between Eras, Periods and lesser divisions in relative time were, and remain, based on palaeontology. Two boundaries between Eras – the Palaeozoic-Mesozoic (Permian-Triassic) at 252 Ma and Mesozoic-Cenozoic (Cretaceous-Palaeogene) at 66 Ma – and a boundary between Periods – Triassic-Jurassic at 201 Ma – coincide with enormous declines in biological diversity. They are defined by mass extinctions involving the loss of up to 95 % of all species living immediately before the events. Two other extinction events that match up to such awesome statistics do not define commensurately important stratigraphic boundaries. The Frasnian Stage of the late-Devonian closed at 372 Ma with a prolonged series of extinctions (~20 Ma) that eliminated at least 70% of all species that were alive before it happened. The last 10 Ma of the Ordovician period witnessed two extinction events that snuffed out about the same number of species. The Cambrian Period is marked by 3 separate events that in percentage terms look even more extreme than those at the end of the Ordovician, but there are a great many less genera known from Cambrian times than formed fossils during the Ordovician. Faunal extinctions during the Phanerozoic in relation to the Stratigraphic Column. Empirical coincidences between the precise timing of several mass extinctions with that of large igneous events – mainly flood basalts – suggest a repeated volcanic connection with deterioration of conditions for life. That is the case for four of the Famous Five, the end-Ordovician die-off having been ascribed to other causes; global cooling that resulted in south-polar glaciation of the Gondwana supercontinent and/or an extra-solar gamma-ray burst (predicated on the preferential extinction of Ordovician near-surface, planktonic fauna such as some trilobite families). Neither explanation is entirely satisfactory, but new evidence has emerged that may support a volcanic trigger (Jones, D.S. et al. 2017. A volcanic trigger for the Late Ordovician mass extinction? Mercury data from south China and Laurentia. Geology, v. 45, p. 631-634; doi:10.1130/G38940.1). David Jones and his US-Japan colleagues base their hypothesis on several very strong mercury concentrations in thin sequences in the western US and southern China of late Ordovician marine sediments that precede, but do not exactly coincide with, extinction pulses. They ascribe these to large igneous events that had global effects, on the basis of similar Hg anomalies associated with extinction-related LIPs. Yet no such volcanic provinces have been recorded from that time-range of the Ordovician, although rift-related volcanism of roughly that age has been reported from Korea. That does not rule out the possibility as LIPs, such as the Ontong Java Plateau, are known from parts of the modern ocean floor that formed in the Mesozoic and Cenozoic. Ordovician ocean floor was subducted long ago. The earlier Hg pulses coincide with evidence for late Ordovician glaciations over what is now Africa and eastern South America. The authors suggest that massive volcanism may then have increased the Earth’s albedo by blasting sulfates into the stratosphere. A similar effect may have resulted from chemical weathering of widely exposed flood basalts which draws down atmospheric CO2. The later pulses coincide with the end of Gondwanan glaciation, which may signify massive emanation of volcanic CO2 into the atmosphere and global warming. Despite being somewhat speculative, in the absence of evidence, a common link between the Big Five plus several other major extinctions and LIP volcanism would quieten their popular association with major asteroid and/or comet impacts currently being reinvigorated by drilling results from the K-Pg Chicxulub crater offshore of Mexico’s Yucatan Peninsula.